Effective comic covers can attract potential readers and convince people to buy a comic book. A good cover should also give readers a clue on what to expect with the comic book. Comic covers are the most important part of comic books, as they actually make or break its sale. A comic sketcher should be able to create a professional-looking cover that catches the attention of anyone and wows people with its content and artistry. 1. Determine the dimensions. Doing this will allow you to balance the characters that you will incorporate in the comic cover. Dimensions can differ, but the standard dimensions for comic covers are 6 5/8 inches by 10 1/4 inches. Remember to maximize the dimensions by incorporating all elements that will compel readers to buy the comic book. 2. Study other comic covers. This is especially important if this is your first time to create a comic cover or if you have no idea how to conceptualize your own. 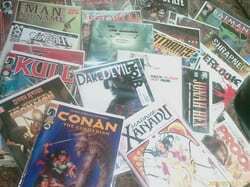 You can study two or more comic books to give you a better idea. Notice how other comic books design their comic covers and apply any concept that you learn into your own work. 3. Plan the concept. Include the main character as well as the other characters in the story, such as the villain. They should be doing something in a certain situation, perhaps a scenario in the story. Include the title of the comic book and make sure that it is clearly written and is not obstructed by any element. Choose a font or letter style that fits the mood of the comic book story. Remember that the font of the letters also gives readers a feel of what the comic story will be like. The plot of the comic cover should be mysterious or “action-like”. Avoid boring concepts that will not interest readers. 4. Know the elements to include when making comic cover. Some of the things to include when making comic cover are the comic book title, logo, author, series number or episode number, publisher’s name, name of the artist, date of publication, teaser image, and the names of the designer, colorist and inker. The front page should also include the barcode. Utilize your space so that it includes only the most important elements. 5. Create a dummy. When making comic cover, position the characters as well as the other elements in their proper places. Move them around and arrange them until you are satisfied with the final output. When arranging the characters, always remember how the human eyes move, which is usually from left to right, onto the middle part of the page and then down to the bottom. Avoid elements that overlap in order to make the images clearer. Avoid including images that make the cover look cluttered and dirty. 6. Be creative. Note that comic covers are the most important part of a comic book, so you should be as creative as you can when creating it. Put yourself in the shoes of the reader and examine your output. Ask yourself this question: Will you buy the comic book upon seeing the comic cover? If you answer no, then you probably have to modify the design. The cover should include a teaser design, which may include one of the most exciting scenes in the comic strip. 7. Choose the right colors. When making comic cover, the colors you choose should be attention-grabbing and attractive. The letters that compose the comic title should be easy to read, even from a distance. Make your comic covers stand out even when placed beside other comic books. 8. Start sketching out the characters. Use a pencil first so you will be able to adjust the characters as needed. Once you have finalized the final look for your drawing, ink them out. Shade them or color them for you to achieve the final look that you want the cover to have. Remember that comic covers are usually colorful and bright in order to make them standout in the newsstand. If you are technical, you can use graphic software such as Adobe Photoshop or Corel Draw when making comic cover. 9. Gather feedback from friends. Ask friends who are into comic books if the cover page for your comic book looks interesting enough to get the comics sold. Gather suggestions on how you can make the cover look more appealing. Sometimes, a second or third opinion can make you determine minor design problems that you may overlook. 10. Make it perfect. You do not need to hurry when making comic covers for comic books. Give yourself enough time to come up with a great cover page. Work somewhere where there is a good source of light, so that you can clearly see your output. If you work with your right hand, the light should come from the left side. If you use your left hand, the light should come from your right side. 11. Make sure you are updated in the comic industry. Find out the latest design trend for comic books. If possible, create a signature look so that your readers will know immediately that it is your comic book whenever they see your comic covers. Just be careful not to copy other’s ideas directly. Try to create your own flavor and style that you think readers will like. A comic sketcher should be able to create a compelling cover for his comic book. Since it is the most important part of a comic book, much time and attention should be given when making comic cover. In fact, big comic companies make their comic covers their top priority. A good comic cover should reflect the current “trend” in comic books so that it does not look old school. It makes use of all the textual and graphical strengths to make it a compelling read. Although there is no exact recipe for a great comic cover, knowing the basic rules should help you come up with a good one.